Solar photovoltaic systems are a fantastic way of generating clean electricity for your home, all year round, but how do they work? How does a Solar PV cell generate electricity? At the heart of a solar PV system are photovoltaic cells; devices which are capable of converting light into an electric current. These photovoltaic cells do the ‘clever bit’ of transforming the sun’s energy into electricity. However they are quite delicate and because of this they are combined by a manufacturer into PV modules (or panels) to protect the cells from moisture and mechanical damage. How do the panels get installed? The installation of a Solar PV system is usually quick and trouble free, with minimal disruption to your home. How does the electricity spread through the home? 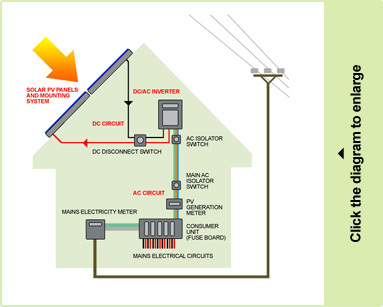 Solar panels produce a type of electricity known as DC or ‘direct current’. However we can’t use this type of electricity directly in our homes and instead use AC or ‘alternating current’. To convert the electricity into the required form an additional device called an inverter is used. The inverter constantly monitors the electricity imported from the national grid, and then modifies the DC produced by the solar panels to match the usable electricity perfectly. A single AC wire will run directly to your consumer unit (fuse box) onto a single MCB (miniature circuit breaker). The location of the inverter and wire runs will be determined during a free site survey of your property. 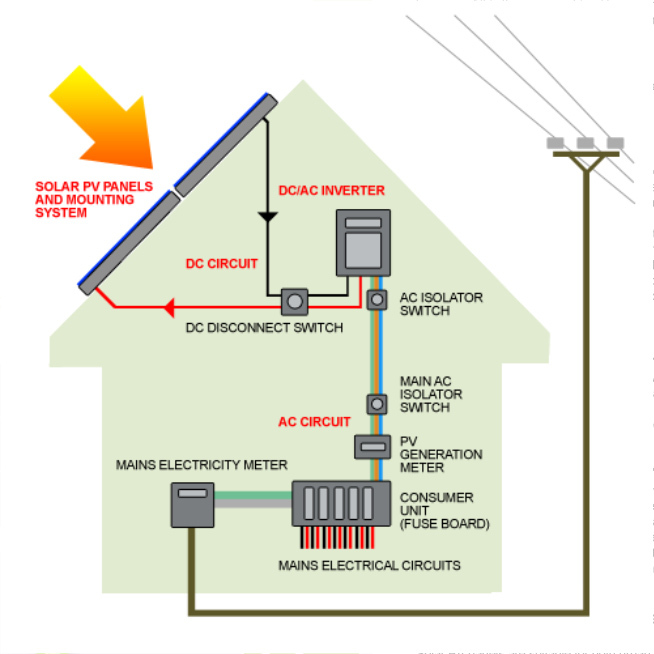 How can I use my Solar PV electricity? Once converted into AC electricity by the inverter, the electricity generated by the Solar PV system is automatically used to power the lights and electrical appliances in your home. Any excess is automatically sold straight back to your supplier via the national grid; you don’t need to do anything. How do clouds affect generation? Solar PV operates on light from the sun, rather than heat. This means that whenever there is light available, the system will be generating electricity; even if the day seems cool and overcast. Although the system will therefore produce electricity all year round, its output will fluctuate seasonally, with the most electricity being produced in the bright summer months when there is a greater amount of direct sunlight available. How do I know if a Solar PV system is suitable for my home? Solar PV panels are suitable for both urban and rural locations and are adaptable to almost any building which has sufficient exposure to light. 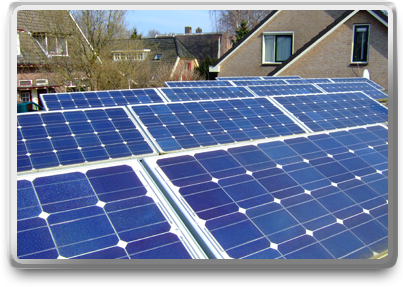 Typically, solar PV panels are mounted on a pitched roof; however they can also be mounted on a flat roof or on the ground. How much will I get paid for my Solar PV electricity? Over the course of a year, a solar photovoltaic system will save you money by reducing your electricity bill. As well as saving you money your system can also earn you money; for typical sized domestic systems under 4kWp you can earn at least 41.3p for every unit of electricity generated by your system. For more information on the financial benefits of installing a Solar PV system see our pages on Investing in Solar PV.